Today marks the 199th anniversary of the Battle of Lake Erie fought between American and British forces for control of the Great Lakes region on September 10, 1813. After British forces captured Detroit, MI, American military planners decided to build a small fleet near Presque Isle to wrest back control of Lake Erie and allow the recapture of Detroit. A force of 9 ships were quickly hewn from local forests and Master Commandant Oliver Hazard Perry sent to take command of the force. On the morning of September 10, 1813, 6 ships under the command of Royal Navy Commander Robert Heriot Barclay moved to sweep the American force from the lake. While outnumbered 6 to 9, the Royal Navy squadron possessed more cannons (63) than the Americans (54) and the British cannons had a longer range than the Americans which had primarily equipped their ship with close-range carronades. In a tribute to Captain James Lawrence who had lost his life aboard the USS Chesapeake earlier that year, Perry’s battle flag stated “Don’t Give Up the Ship.” At the outset of the battle, Barclay’s squadron had the advantage over the American vessels as possession of the weather gauge allowed his ships to outmaneuver the Americans and use their longer range fire power to pound the Americans. 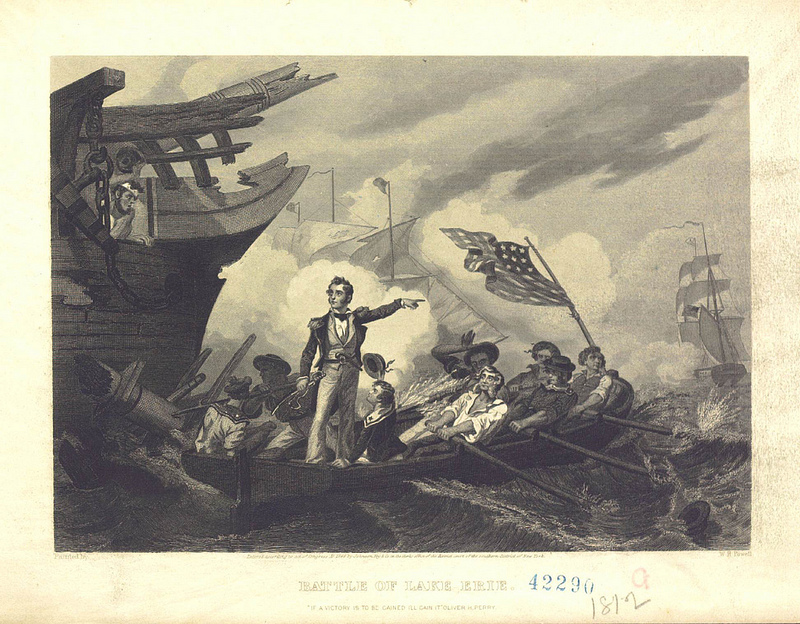 The British used their advantage to batter Perry’s flagship USS Lawrence into a hulking wreck, but undeterred, Perry transferred his flag from the Lawrence to the USS Niagara where he continued the action. Perry’s fleet had not let the British escape unscathed, though, as Commander Barclay and several of his officers had been wounded, putting command of the ships in the hands of less experienced officers. The British attempted to wear-to in order to bring their opposite broadsides to bear on Perry’s bruised fleet, but miscommunication and poor seamanship caused two of the British vessels to collide. Perry then split the British column, a maneuver even more deadly than “crossing the T,” allowing his ships to pour fire from both broadsides into the British squadron. This effective maneuver by Perry and his squadron devastated the British ships and one by one the squadron surrendered, giving Perry and his squadron the greatest American naval victory of the War of 1812. Perry’s victory at the Battle of Lake Erie opened the door for an American invasion of Canada and the recapture of Detroit. It also was the first time an entire British squadron had surrendered in battle. Oliver Hazard Perry became an overnight American hero and his notification of victory, “We have met the enemy and they are ours,” has been forever written in American naval history. More than half a dozen ships, including a class of modern-day frigates, have been named in his honor and the latest ship to bear his name is currently under construction in Perry’s home state of Rhode Island.